From Earth To Plate: Notox Box! It was a cool winters morning in July, a sense of stillness in the air as the sun was still yet to rise. I look down at the front door & see that someone has been, a package has arrived on my front terrace, my smile lifts from ear to ear as I dash out into the darkness to fetch just what might be my boho box of delights that I have been eagerly awaiting for all month. Its official….. CHRISTMAS in JULY has arrived as I pull the draw string made of yarn & my ECO Notox box falls open to unveil an array of this months must have eco, beauty, nutrition & clean living essentials. Notox Box is an Australian based company operating out of Sydney & delivers nationally not only the Notox Box but an array of eco, beauty, nutrition & clean living essentials that can also be made into nourishing gift boxes for all you love. Notox boxes mission is simple. Finding the perfect products that work for you can not only be costly, time consuming & confusing but leave you with products that aren’t the natural CHEMCICAL FREE goodies you thought they were & so the Notox box was born to life, a company that dedicates itself to sourcing, researching & road testing only the best 100% ALL NATURL from earth products. Notox Box now nourishes Australians from all walks of life that wish to find the perfect products to complement YOUR “from earth to plate” wholefood lifestyle. Once subscribed it really is like Christmas every month as your blissed out box gets delivered with love straight to your door. Q. Sharon what was your inspiration to create an Eco clean living company? A. I started Notox Box to create a positive encouraging space to help people on their own health & wellness journeys. 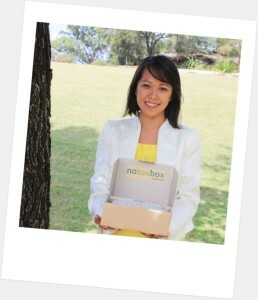 The idea for Notox Box came about as I was dealing with chemical sensitivities and food intolerances. I was lacking energy, dealing with severe stomach pains, and breaking out in rashes & eczema. After seeing doctors, dermatologists, nutritionists, and a range of holistic practitioners, I slowly built my knowledge, and replaced my products. But it was overwhelming, and it was difficult to find good products. Along the way, I found so many busy people wanting to be healthy but also finding it hard. I thought there had to be an easier way. I couldn't find it, so I set out to create it. Below is an example of the handpicked winter essentials that were featured in the July Notox Box. The boxes have been exceptionally designed with the earth in mind & with absolute attention to detail from the Notox menu of products to the marketing which explains your goodies benefits. My Nourishing Notox Box Date Night! These pure magnesium chloride bath salts are sourced from the deep mysterious depths of the ancient underground Zechstein Sea, 1800 meters to be precise. Highly absorbable & with a potent Zen out charge they left my body, mind & soul relaxed whilst my nervous system was fed with magnesium. 2. Time to see what’s going down in the “from earth to plate” world with your personal copy of the nourishing ALIVE Magazine. Knowledge is power & this little natural living bible will be sure to inspire your inner Eco warrior. 3. What yummy gluten free treats am I going to cook this week with my nutrient rich, fresh ground coconut flour which is a FULL SIZE PACK! Time to get inspired by alive magazines recipes & put my Pacific Organics Coconut flour to good use. The name really does say it all as my skin was fed with the nourishing likes of chamomile, lavender, mandarin essential oils & deeply hydrated with the penetrating jojoba oil & nutrient rich sesame & sweet almond oils. 5. With bath time over its time to continue the bliss & retreat to the lounge where my platter of fresh treats await. First I enjoy the blissed out goodness of the %100 natural vegan & sugar free Goodie Balls which contain 8 different nuts, seeds & fruits followed by the antioxidant rich walnut & acai Artisse wholefood bar… my personal FAVE & to finish an array of raw nuts, seeds & sun dried fruits by Absolute Organic Fruit & Nut Mix. Notox Box would love to offer our readers a special offer of 10% off when purchasing everything from the Notox Box site (excluding our monthly subscriptions, notox box gift vouchers, notox box gifts). Valid till 31 August 2013.